Beautiful You: What I Got For My Birthday Haul! What I Got For My Birthday Haul! As some of you may of known it was my birthday last Thursday and I thought that I would share with you what I got. I know some people think that these posts are just a way of bragging but I am just going to say now that I was and still am extremely grateful for everything that I received. I simply cannot thank my family and friends enough, with that out the way I hope you enjoy having a nosey into what I got! My main present from the whole of my family was my amazing Canon 600D camera, I cried when I opened it. I told my family that I would like it for my birthday and they kept telling me that they weren't able to get it or they don't think that they had the right one but they are the best people ever and its beautiful! Then as next year me and my flat mates are moving into a house in Bournemouth I wanted a beach theme in my room. My sister knows this and at the moment in Next they have they have a collection with a lot of seaside items in. She bought me a canvas photo that says 'memories made at the beach last a lifetime' which I have wanted for ages and I even think it will go in my room at home for now. She also got me a bottle with a message about the sea in, some bottle and shell string lights which are so adorable, a sign that says 'a whale of a time' and lastly a door stop that says 'you never know where an open door may lead'! She also bought me some pig socks because they are my favourite animals and lastly her and my step sister Kerry bought me a flower Pandora ring which is beautiful! My step brother and his wife bought me some nail varnish from Sally Hanson and I've never tried them so I might do a review on here once I have tried them out. They are all glittery, a light blue, light pink and two plum coloured ones so I will definitely try them out and let you know how they go. If you have them or have used them before let me know what you think in the comments. Lastly, my amazing flat mates threw me a surprise birthday party in the flat with mocktails, party poppers and more presents. They had decorated the communal area in our flat with balloons and banners too which was so nice of them. I had four presents wrapped up in anchor paper laid out on the table with the biggest card ever (typical) and they bought me a flannel (inside joke), a bottle of Snapple because I'm obsessed, a orange glasses case and a weekly organiser that goes with my room for next year. 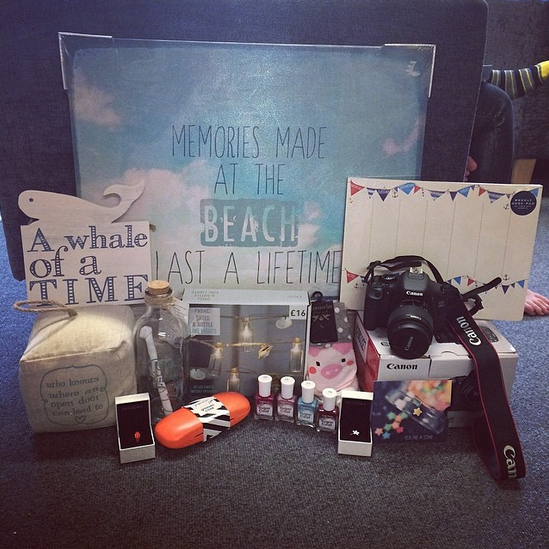 All of the presents were so thoughtful and I am very grateful for having such amazing friends at uni! I may have also been cheeky and bought myself a little birthday present. On my birthday the new summer collection came out in Pandora and it is orange and turquoise tropical theme and I couldn't not buy myself an orange charm for my bracelet! Like I said at the top I am a very lucky girl with an amazing family and friends and I had a brilliant birthday despite the fact I had a three hour EU law exam in the morning. I hope you enjoyed seeing what I got for my birthday and if you have any of these things or want any of these things then let me know in the comments! As most of you will know by now I am starting a YouTube channel and loads of you have been asking for the link, well the wait is nearly over and I am releasing the launch information on Friday so keep your eyes peeled, see you then! EU Law sounds like a great way to start your birthday ;) Looks like you had a greta day though, love the beach print and as a Cannon 600D owner I can honestly say you won't regret the camera choice - I've had mine for about 2 years now and still love it! Aww :) how lovely! How nice of your flatmates to throw you a surprise party too ^_^!! I have the same camera! I'm in love with it.